Maintenance Tips from the SEWERMAN! One side of your sink won’t drain. Tub won’t drain or is draining slow. Bathroom sink drains slow or not at all. 1 cup drain cleaner to 4 cups water. First 1 treatment for the kitchen sink, and then 1 treatment split in all other drains, unless you have a lot of drains, then make 2. 1/4 cup treatment to 4 cups water. To be done once a month at night when you’re done running water for the night. In the morning, turn on the warm water and let it run for about a minute or so. Make one treatment for your Kitchen sink and another to be split between the rest of your drains. Then, if you notice a single drain running slow, make a batch of shock treatment for that one drain once or twice. If it improves go back to your monthly treatment; Otherwise, call HAWKEYE SEWER & DRAIN at (319) 337-7252 to have lime cleaned out. Should be done every year or two. Sewer lines don’t go bad overnight – they take years, so if you’re doing maintenance, you should have advanced notice to a problem. Remember there is no good time for a back up. More than likely, it’s going to happen NIGHTS and WEEKENDS & HOLIDAYS . Because that is when you’re home the most! Still have a sewer line problem? 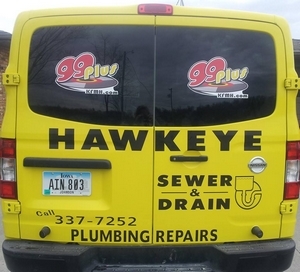 Call HAWKEYE SEWER & DRAIN at (319) 337-7252 to have line cleaned out. Where your misfortune won’t cost you a fortune! Should be pumped every 3 to 5 years. To help them do what they do, you should add some treatment every 6 months. If you still have septic tank issues, call HAWKEYE SEWER & DRAIN at (319) 337-7252. Where your misfortune won’t cost you a fortune!